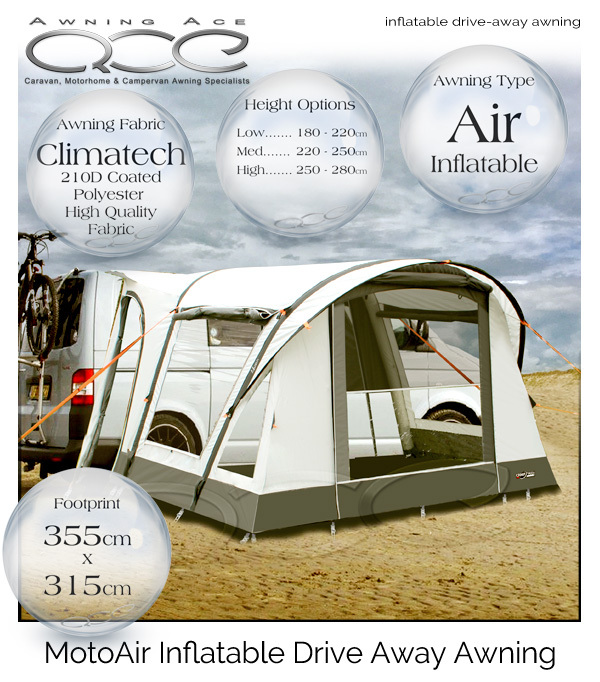 Make the most of your motorhome with the addition of the new Camptech MotoAir free standing drive away awning. Pitched in less than 10 minutes the inflatable airframe is strong and stable, doubling the living space of smaller campervans. With an impressively large 355 x 315cm living area and fully sewn in groundsheet, space is light and airy as well as being dry and spacious. With plenty of windows, all with fitted privacy blinds, and plenty of ventilation with fly screen mesh secondary panels you have total control over the internal environment. The impressively flexible real tunnel cowl has convenient access doors on both sides allowing access to your vehicle without walking all the way through the awnings main living area. The entire tunnel section can be zipped closed and rolled away so you can leave your awning secure for the day ready for your return later. 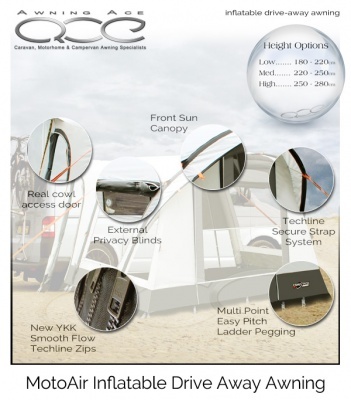 Technline Secure straps and high visibility guylines ensure your awning remains firmly pitched and incredibly stable. 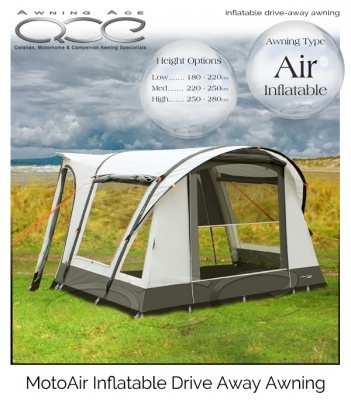 A bedroom inner tent is also supplied and can be hung from the pre-fitted roof ringlets to increase your sleeping accommodation or when unexpected guests decide to stay the night. The bedroom inner tent is hung in seconds and can be removed and stored without fuss to utilize the entire awning as living space. The awnings rear tunnel is fitted with dual awning beading (both 4mm and 6mm) so can be attached directly to your Fiamma or Omnistore roll-out canopy or attached directly to standard awning rail. Other fitting options include; magnetic drive away fixing kits and simple figure of eight gutter fixings or the awning can be attached to roof rails or roof bars (additional fixing kits may be required). If you are unsure how to attach this awning to your vehicle, please give us a call and we’ll help you decide. 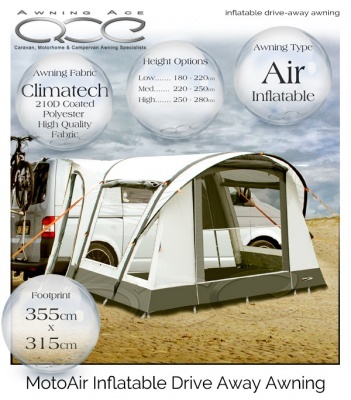 Constructed from Climatech 210D coated polyester material and fitted with a simple yet convenient front sun canopy, the Camptech MotoAir is easy to pitch, very strong, incredibly stable and very easy to pack and store in its own convenient storage bag. 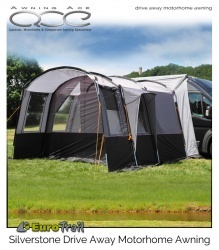 This feature packed awning is the ideal choice for busy touring campervan and motorhome enthusiasts and offers superb value for money in a very easy to use awning package – freedom on the road with a small price tag. Grab a real bargain, before its gone! The all-new 2018 EuroTrail Silverstone Free Standing Motorhome awning is a superb example of how a drive away awning package should be made. Utilising strong 19mm steel poles with high-performance 12.7mm fibreglass sections which provide the perfect balance of weight and strength. Carefully designed to make the awning easy to use and simple to pitch, the Silverstone's coated polyester 185T fabric with heat sealed seams is durable, UV stable and waterproof.